Senem Pirler is an intermedia-sound artist whose work includes sound engineering & production, sound design, as well as video art and audiovisual performance. Born in Turkey, she studied classical piano at Hacettepe State Conservatory and sound engineering & design at Istanbul Technical University (MIAM). 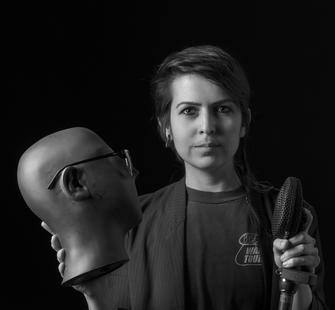 She developed her artistry over ten years working as a composer, performer, and recording engineer in Turkey before moving to the U.S. in 2010 to study Music Technology at NYU with a Fulbright Fellowship. She is currently finishing her Ph.D. in Electronic Arts at Rensselaer Polytechnic Institute and working on her practice-based dissertation, titled “Creating a Queer Utopia in Audiovisual Space.” Her current artistic practice is an interdisciplinary attempt that crosses over into sound art, video art, dance, performance, and installation. Pirler’s recent work has been exhibited at EMPAC, Roulette, BAC, and Collar Works, NY.